I was inspired by your example, James! 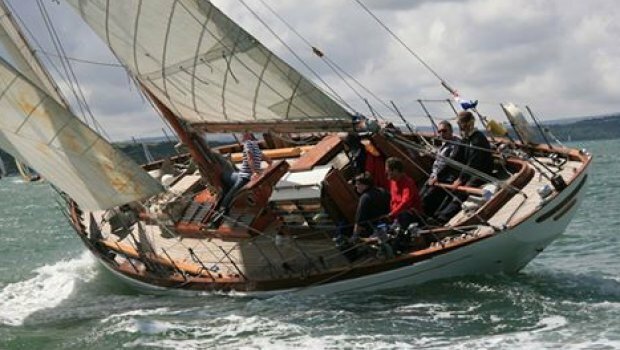 She is “Croix des Gardes”, she lives on the Orwell, when not hibernating in her private barn in Cambridgeshire and she belongs to Pyrojames, who rescued her and rebuilt her and sails her singlehanded making it all look very easy. 52ft on deck and 22 tons. (You will notice that she is steered with one of those stick things, not with “his” and “hers” wheels in the modern manner). Last edited by Minn; 25-01-19 at 13:43. Not always sure about MABs but classics have the potential to be gems and Pyrojames has cut Croix des Gardes just beautifully. Credit to his workmanship and dedication! I'm looking for a broad range of views from forum members on the longest cruising yacht for a single-handed sailor assuming that sailor has average skills, not a seasoned professional. All input greatfully received. Depends on your age / fitness and the gear of the boat. Knox Johnson at 70 did a round the world on a 65 ft steel boat single handed. It also depends on where you sail. I could handle my 36 footer rounding lands end but I wouldnt try to short tack her through moorings thanks to a masthead rig and 140 genoa. this post is a personal opinion, and you should not base your actions on it. No tacking through moorings under genoa for me. Mind you, we were enjoying a pint on the RHYC lawn this summer when a 12 metre came elegantly past, doing exactly that, in rather a narrow part of the river. We were most impressed! Wish I had been there watching...+the pint. My bro was doing his YM and prepped to depart the pontoon. Bit of tide, so springs and other methods to to get off cleanly. Instructer asked why he was not starting the engine. Bro replied it was they way we used to do it when we didn't have one. But I will start it to keep you happy. Out of interest, did the 12 HAVE an engine? I spose they do, once out of 'that' racing class. Plus insurance considerations. And it appears to be well balanced, with just a little weather helm. Take my hat off to Pyro James for that superb effort. Spotting whether the engine is running is a family game but we could see no sign. Chapeau to her crew, who were spinning her on a sixpence and sheeting that genoa in a boat's length.